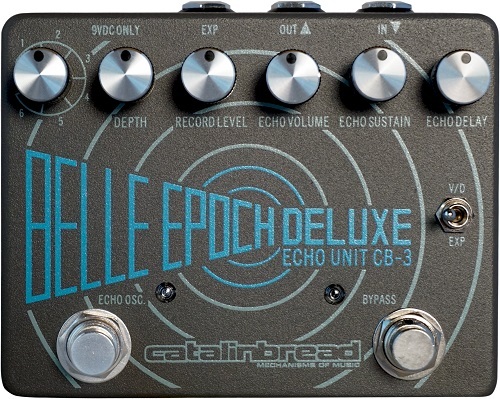 The Catalinbread Belle Epoch Deluxe is an exact reproduction of the iconic 1970’s Maestro Echoplex® EP-3 – the only difference is there is no tape! True to Catalinbread form, each component is thoughtfully and meticulously ear selected to bring you the most accurate EP-3 feel and sound available in pedal form. Players for decades have sworn by the Echoplex, not just for the delays, but for the sonic enhancement it brings to the player’s rig as well. This is widely accepted consensus by now as there are several EP-3 inspired boosters on the market. But the third aspect of the Echoplex was that it was a live performance instrument unto itself. Catalinbread’s addition of the expression pedal control over delay time, delay playback head volume, and even rotary speed and filter sweep behaviors expands the legacy of the Echoplex as a performance instrument. Then we went further and added a momentary footswitch for echo oscillation, tunable via an internal trimpot, for even more sonic potential that even the originals did not possess! As if that weren’t enough – we then expanded the possibilities even further by adding 5 more sonic layers to the Echo cake! Echo Programs 2 through 6 feature a warmer ‘analog delay’ flavored mode, Rotary, Filter, DMM Chorus, and DMM Vibrato modes – all benefitting from that magical EP-3 preamp feel.